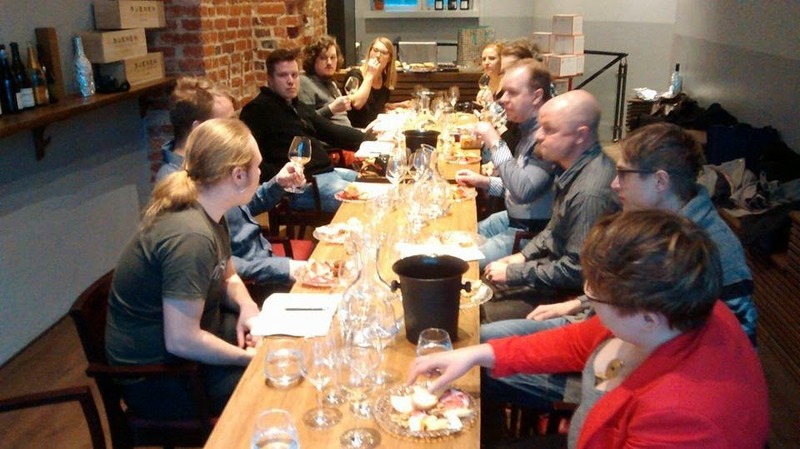 On 21 March Saturday I attended the first meeting of Finnish wine bloggers, Kevään Miitti/The Spring meeting and it was amazing to meet the wine lovers at the same time blind-tasting several wines while having some snacks together. A very lovely woman and a good friend, Heta of Viinilla blog took a lot of responsibility for this meeting and we all had a great time with wine, about wine and into wine! The schedule was calling for meeting at 3pm in front of Helsinki Distilling Company at Teurastamo. I have been professionally interested in wine culture almost about 3 years now, and in time, this wine interest also took me into premium beers and good whiskies and I became an advocate for these beverages too. So, visiting Helsinki Distilling Company was I think a great start for such a great meeting. So, on Saturday, 21 March, we all met about 3pm at the distillery and a very friendly cool man, Séamus of HDCO warmly welcomed us and he quickly started to introduce the building and the project to us. Séamus is an Irish man, who would be a great partner for a political conversation during/after a few beers (Usually Irish people have a lot to say about politics for sure as a historical result), and his interest in whisky making business was not a surprise for me anymore after I knew he is Irish. He gave us a great amount of info about the distilling premises, even the names of the 3 steel tanks named after the 3 workers carrying them in. I lost the names since i took my notes into my phone and lost some of the data. Thanks to technology. Séamus told us how they found the building, all the challenges and problems they went through and finally how they did set up all in Teurastamo. He also introduced us their products -whiskies, gins, applejacks- and upcoming trials on different products/ideas after he told us the details of their production line. It was amazing to be there and be able to ask anything directly to the CEO of the company. They do organize tours in the distillery, well, do u have a friend who is into distilled products? Dont you have enough money to buy him/her a ticket to Scotland or Ireland as a gift? Contact the distillery and take your friend to a distillery tour, it is very reasonably priced. Then we all headed to Nomad Cellars which is a relatively new wine cellar and tasting room in the very heart of downtown Helsinki. It is started by the business partners Petteri Laine and Kale Angus. I have done and still doing some business together with them. They are very relaxed and calm people who are very easy to go along with and I am really happy to know them. After the tasting we all had some small chat, drank the rest of the wines and tried to get to know each other more. The next stop was Restaurant Grotesk for the bloggers but I was not able to join them at that part of the night. People left, I finished my last drops in the glass, cleaned around little bit. I was feeling the satisfaction of being with people who are into wine, who take wine serious, who put effort, spend time and money on it. I left the cellar, I was satisfied and happy, my hands in my pocket, slowly heading home while thinking about wine and how powerful it is as a culture or was it me giving it the power, slowly walking in the evening of Helsinki streets, what time it was.... It was after the sunset, but before the midnight, after the offices were closed, but before the taxi drivers started their long night work, after lots of people started to get drunk, but before they got wasted, after the shops were closed, but before the prostitutes occupied the corners, after people started to meet each other, but before they got refused and confused, after the lonely nurse started her night shift, but before she fell asleep on the desk... After the end of a good day, but before the procreative night started. May your glass be filled with intelligent wine. Greetings.